The United States purports to be a strategic partner and ally to our neighbor to the north, but if we hope to improve relations between the two countries, we'd better start producing a better homage to the de facto national dish of Canada - poutine. 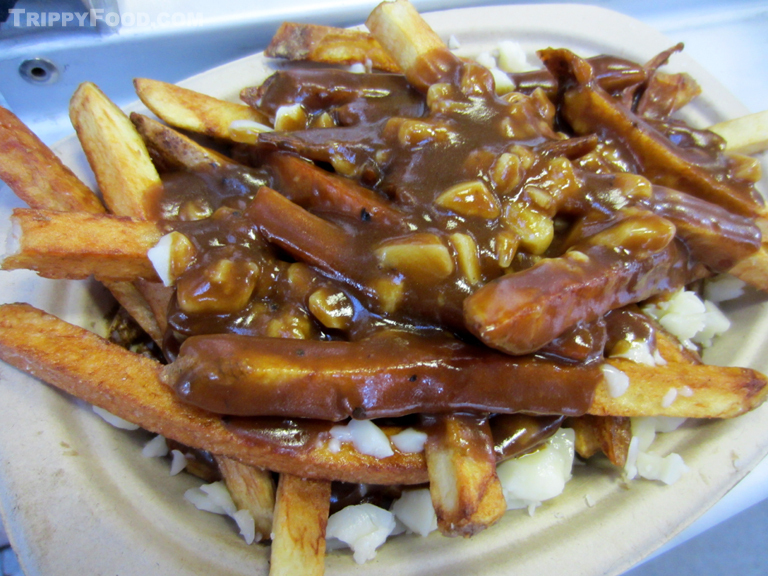 Although the most basic poutine is widely referred to as classique, the sloppy dish (named from the Acadian slang loosely translated as "a mess") is a relatively modern contrivance. Folklore credits Québec restaurant owner Fernand Lachance as having invented (or at least named) it in the late 1950s; in later years, the dish's popularity spread across Canada, although Québec Province is still credited with producing the best poutine. Poutine is a relatively simple dish, a casual item better suited to being served in a cardboard, plastic or Styrofoam bowl than on fine china; this is a food of the people, street food extraordinaire, and although it has evolved later in its life to include a variety of toppings, you will always be able to get the classic dish wherever French fries are served. 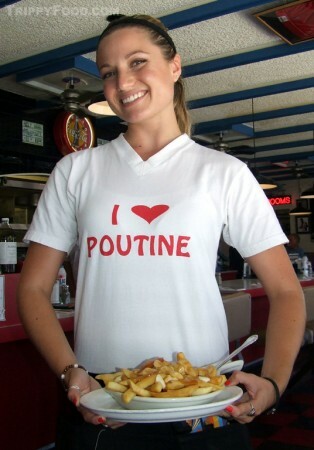 Classic poutine adheres to some very basic rules for authenticity, regardless of where it is served. The potatoes used are generally freshly hand or machine cut into thick fries, although some of the fast food chains will use frozen pre-cut fries. 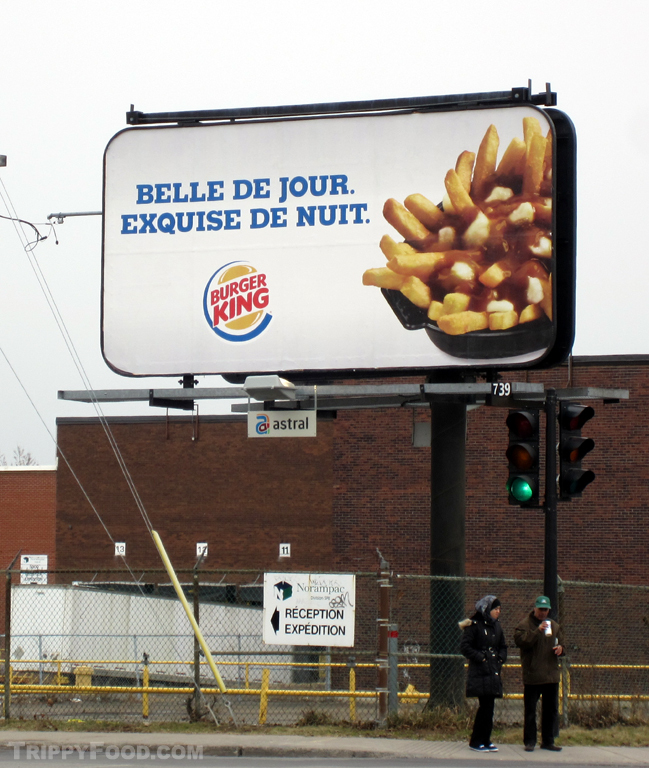 In addition to franchises with household names to Americans such as Burger King, A&W, McDonalds, and PFK (Poulet Frit à la Kentucky), the classique is available at homegrown chains like Montréal's Lafleur and Québec's Chez Ashton (where most Québécois on the street will direct you). The cheese makes all the difference in the world (or at least in the north of the Western Hemisphere); by Canadian law, anyone caught dribbling Velveeta or Cheez-Whiz over the potatoes is staked out in front of a bear den and covered in maple syrup. Traditional poutine uses only fresh Cheddar cheese curds; the true test of authenticity is determined by the teeth. When properly manufactured, the cheese nuggets will squeak with each bite - while this can be off-putting to some tastes, it is what will prompt a true poutine aficionado to take that second bite. The curds are a critical ingredient; any substitution leaves you with cheese fries, unworthy to bear the poutine title (you might as well layer Kraft American slices on your Freedom Fries and call it a day while you dine alone on a park bench outside Disneyland). The final component to the traditional classic poutine is the medium-thick, savory, brown sauce that coats the fries and curds. The sauce (referred to as sauce, chicken gravy, or just plain "gravy") can vary in consistency and taste between different vendors. Although the sauce is brown, if differs drastically from the gravy Americans douse their mashed potatoes with or the familiar bottle of HP Sauce found on the bar in most British pubs. The gravy is chicken-based with some basic spices and onion, but the irony is that while only freshly made cheese curds are acceptable, the sauce is generally made from a dry, pre-packaged mix reconstituted with water. Although the thought of cloaking the dish with a powdered mix sounds unappetizing, the result is usually sturdy nectar that you'll be sopping up with the last of the remaining French Fries. Each comes in two sizes, and unless you hang with Adam Richman, I highly recommend the smaller, Frisbee-sized portion. Other restaurants in Montréal feature a single, unique, signature poutine dish that is can frequently be described as "upscale"; Montréal's chef laureate Martin Picard is renowned for his legendary foie gras poutine which is served at his Au Pied de Cochon, and at around $25 this ain't Joe le Plombier's poutine. Restaurant Hachoir on restaurant-laden Rue Saint-Denis offers a dish simply known as "The" poutine - this generous bowl is stocked with fries buried beneath dark, rich gravy laden with duck confit, sautéed mushrooms, and Grosse-Île tomme (a cheese curd manufactured in the style of Grosse Isle, a tiny island north of Québec on the Saint-Laurence River). 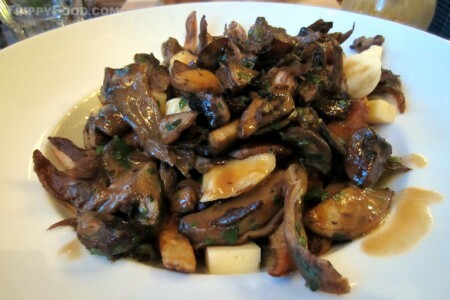 The tender pieces of duck fall apart on your tongue and complement the earthiness of the mushrooms and the hearty sauce, providing a contrast in texture to the squeaky curds. Lester's Deli (a Montréal landmark since 1951) features a menu item that embodies the spirit of two famous local dishes - the smoked meat poutine. This dish crowns a poutine classique with a mound of chopped smoke meat that renders the rest of the dish invisible; in fact after consuming the proliferation of tender brisket you may not have room left for the underlying poutine. 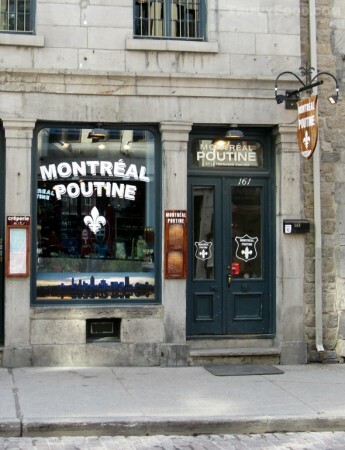 American attempts at poutine usually approximate upscale chili cheese fries; some of the nobler endeavors use fancy ingredients such as short ribs, pork belly, kimchi and a variety of other items that would leave a Québécois shaking his head. As much as these bistros and food writers tout these tributes as "ultimate" poutine, or describe the restaurants as places where you can "eat like a Canadian", very few capture the essence of the dish. I have found several exceptions to this sad state of affairs, and undoubtedly there are others lurking around the U.S. (most likely in the northern states). In Southern California, the one place that is overlooked in local reviews of poutine destinations is Redondo Beach Cafe. The retro 50's diner with its Postmodern NHL decor was founded by two Montréal expatriate siblings, Chris and Kosta Tsangaris, and in addition to both poutine classique and Italian poutine done right, they also feature a close approximation to a traditional smoked meat sandwich almost as good as you could expect to find in Montréal. 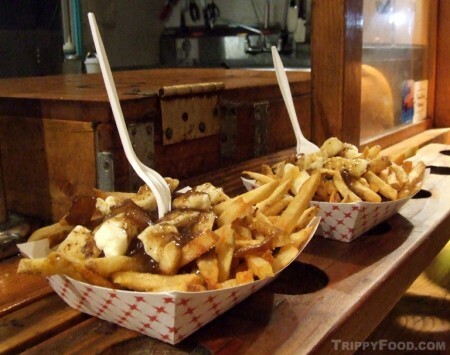 Farther north, Potato Champion has been selling classic poutine from its food cart at the Cartopia pod located at Southeast 12th Avenue and Hawthorne Boulevard in Portland, Oregon. Like the other food carts that inhabit Cartopia, Potato Champion stays open until 3 A.M. (many of the other pods in Portland close with the business day), able to service the outpouring of nightlife driven out by a 2:30 A.M. last call. The cart only sells potato items, and although they only feature the poutine classique, it is done properly with freshly cut fries waiting patiently in a gigantic mound beside the fryer and topped with fresh cheddar curds. They also feature a vegan option, but if you're that concerned with what you're putting in your body, you probably shouldn't be eating poutine; I don't even want to know what vegan cheese curds taste like. 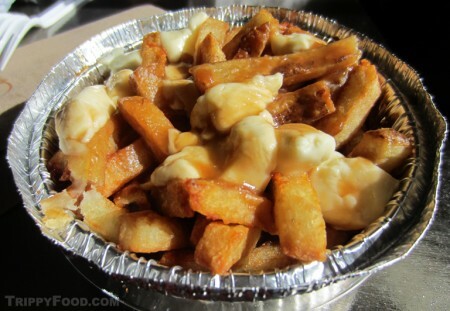 In March of 2012, Evan Goldberg and Tum Rotbard put the Gravy Train Poutinerie on wheels in Los Angeles County; although the menu is laden with Americanized poutines that might raise some eyebrows in Québec Province, the first item is their take on the poutine classique, "The Traditional". 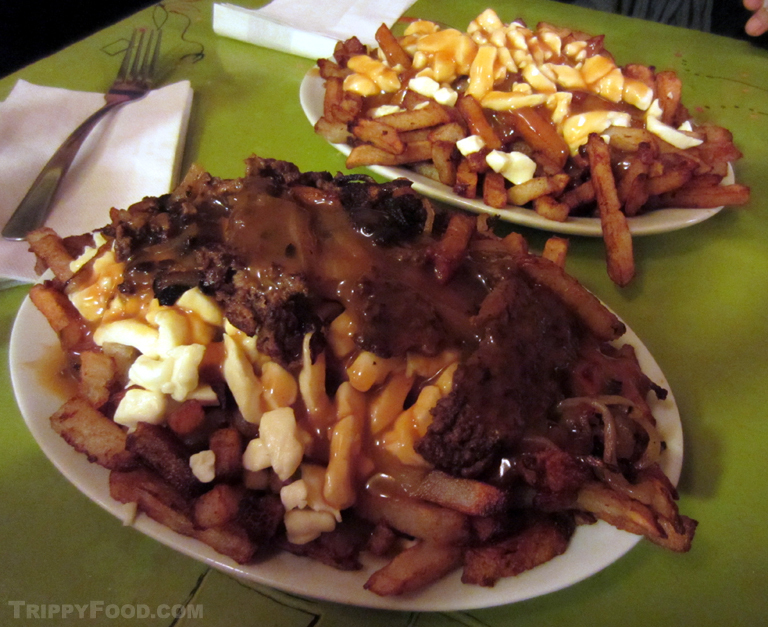 The dish was reverse engineered after an early morning encounter with poutine in Montréal, but over time it has been tweaked it to their specifications. The cheese curds are shipped frequently from a dairy in Wisconsin that manufactures the white lumps of Cheddar in what operator Joe Nacion calls "Mozzarella-style"; rather than make the brown sauce from a mix, Gravy Train uses a bacon-based brown gravy. Russet Burbank potatoes from Idaho are cut, quickly parboiled and then flash-fried on demand. The resulting dish is a rich, salty mess that could easily rub elbows with Montréal's best. Although the custom curds in my dish seemed to have a milder squeak, the superlative brown sauce more than made up for it. Gravy Train has also created a fried curd side dish that is fried tempura-style using their own recipe for the batter - even though the golden bites are scalding hot, the centers still have some teeth to them. This entry was posted in Montréal, Portland, Oregon, Québec, Southern California and tagged A&W, Acadian, Au Pied de Cochon, brown sauce, Burger King, Canada, Cartopia, casse-croûtes, cheddar, cheese, Chez Ashton, chicken gravy, classique, curds, Dulton, Fernand Lachance, French fries, Galvaude, gravy, hot dogs, Italian, La Banquise, Lafleur, Lester's Deli, Martin Picard, McDonalds, Michigan, Montreal, Oregon, PFK, Portland, Potato Champion, Poulet Frit a la Kentucky, poutine, Pub McCarold, Quebec, Redondo Beach Cafe, Restaurant Hachoir, smoked meat. Bookmark the permalink.